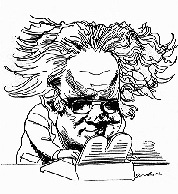 Welcome to The Educated Imagination, a blog dedicated to Northrop Frye. What would have been Frye’s 97th birthday passed just this last month, it is the dog days of summer, many people (if not most academics) are doing as little as they can credibly get away with, and that perhaps makes it a particularly good time to launch this blog. A companion online journal, Myth and Metaphor, will be appearing shortly. More about that in a moment. The purpose of this blog is to provide an online meeting place for the Frye community, which, we hope, will extend beyond the university to include those who maintain a lively interest in literature and the arts. You’ll notice that we are more or less a blank slate at this point: an out-of-the-way site that Google still struggles to locate (so please remember to bookmark us), one post, two external links (one academic, the other appropriately festive), and a remarkably unsexy email address (fryeblog@gmail.com). We hope therefore that you’ll soon inundate us with advice, observations, queries, and requests. We wish the blog to take on the life of the community it is intended to serve, and to do so in the spirit of the man to whom it is dedicated. We are, that is, open to all comers. The Educated Imagination is fully accessible to anyone who visits the site. We enourage you to subscribe to our Entries RSS so that you’ll be notified via your RSS Reader when a new post goes up. While you’re at it, why not subscribe to the Comments RSS as well in order to be informed of the latest comments posted by members of the Frye community at large? (If you need to, you can link to our RSS FAQ to find out how RSS works.) Please also send us anything you think we ought to know about, whatever it is. We are on the lookout for audio, video, vintage photos, heartwarming anedcotes, you name it. Send us links you have but we don’t. We are also calling for contributions to our online journal, Myth and Metaphor, which should be up and running very soon. Myth and Metaphor will include both peer reviewed scholarship and articles of general interest to reflect Frye’s broad readership. If you’re sitting on an article that hasn’t yet found the right home, consider this an open invitation, even if it isn’t about Frye. If it deals with literature, culture or the imagination in a way that is literate, cultured and imaginative, send it to us. Until the journal is operational, feel free to submit it to our email address here. In the meantime, let’s get the conversation rolling. Drop us a line simply by hitting the “Comment” link below. Or send us an email. We will always be happy to post it. Literature is a human apocalypse, man’s revelation to man, and literature is not a body of adjudications, but the awareness of that revelation, the last judgement of mankind. It’s almost 50 years since Frye wrote those words, whose terms of reference may now seem quaint at best. But those who continue to read him no doubt continue to feel their power. Frye begins The Educated Imagination by asking a series of simple questions about the study of literature. Perhaps we should begin by doing the same. Why, after a half century of undeniably radical changes in the study of literature and the arts, does Frye’s critical vision remain so compelling? Why does he regard criticism as a “revelation,” and what does he think is being revealed? Responding to these kinds of questions may serve as part of our purpose here. This entry was posted in Uncategorized on August 17, 2009 by Michael Happy. CONGRATULATIONS AND THANKS TO ALL THOSE WHO SET UP THE FRYEBLOG. Congratulations on this new venture! I look forward to seeing the journal: it sounds very promising. I thought I would check in Frye’s diaries for a record from August 17 ; most of them didn’t last that long into the year, but in 1950 he was attending a conference on poetry at Harvard: “The two Canadians had all the wit, & Klein was very contemptuous of the Americans afterward, but he perhaps forgets how mature he is in comparison with them. I liked young Lowell, a very poor showman, which I thought was all to his credit . . . A man named Wilbur & Theodore Roethke I thought had a bit more on the ball” (Collected Works 8:437). Best of luck with both blog and journal!! Terrific idea, and a somewhat auspicious day down here in Virginia, where just today I received my copies, hot off the press, of NORTHROP FRYE: SELECTED LETTERS, 1934-1991 (Jefferson, NC, and London: McFarland & Co., 2009). From the thousands of letters in the Frye Papers at Victoria College I selected 695 for this collection. It contains one letter written on 17 August–to Angus Fletcher in 1972. Blog with power! All the best. Northrop Frye has, more than any other literary critic, granted me a greater capacity for realizing literature’s imaginatively transcendent power. I certainly look forward to all discussions here leaving as indelible a mark on me as his writings have. And I must say this blog looks fantastic so far.